An industrial and manufacturing systems engineering (IMSE) faculty member has been recognized for his three-decade commitment to teaching. John Jackman, an associate professor in IMSE, received the John L. Imhoff Global Excellence Award for Industrial Engineering Education at the 2018 annual conference for the American Society of Engineering Education (ASEE) earlier this week. Gül Kremer, C.G. 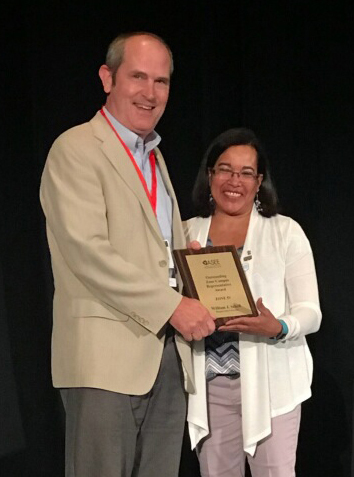 “Turk” & Joyce A. Therkildsen Department Chair and professor of IMSE, nominated Jackman for the award and was at the conference in Salt Lake City for the presentation ceremony. Jackman joined the IMSE faculty at Iowa State in 1987. He holds a PhD in industrial engineering from Penn State University and has professional experience in the aerospace, pharmaceutical, and simulation software industries. His research at Iowa State focuses on inspection technologies and manufacturing systems. During his three decades of teaching, Jackman has advised more than 30 graduate students and has taught undergraduate courses in manufacturing systems engineering, stochastic modeling, and simulation as well as graduate courses in enterprise modeling and integration and requirements engineering.